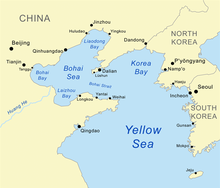 The Korea Bay, whiles the Wast Korea Bay (Hangul: 서조선만 or 서한만; Hanja: 西朝鮮灣 or 西韓灣; Korean pronunciation: [sʰʌdʑosʰʌn.man] or [sʰʌhan.man]) is a northren extension o the Yellae Sea, atween Liaoning Province o Cheenae an North P'yŏngan Province o North Korea. ↑ Merriam-Webster's Geographical Dictionary, Third Edition. Springfield, Mass. : Merriam-Webster. 1998. p. 605. ISBN 0-87779-546-0. ↑ Merriam-Webster's Geographical Dictionary, Third Edition. Springfield, Mass. : Merriam-Webster. 1998. p. 606. ISBN 0-87779-546-0.